C.R.A.F.T. # 46: Grey Scale Quilt - C.R.A.F.T. I really enjoy creating quilts…if you can sew a straight line you CAN make this quilt! 1: Make a simple design on graph paper, I was going for the faded look! 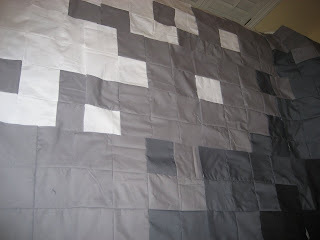 3: Cut out all of your squares…I used white, 3 shades of gray and black fabric. I used my graph paper design to figure out how many squares of each I needed. 4: Using your graph paper design, begin sewing groups of 4 squares together. 6: Lay out your entire quilt with the sets of 4 sewn squares. 8: Repeat this pattern for the entire quilt. You last line of sewing should be to sew one half to the other half…does this many any sense?! 10: Take it to your local quilter…I love my lady, and pick out your favorite design…I chose crazy swirls! 12: Get the quilt back, be amazed at your self, and then buy double sided bias quilt tape and sew on the border! wow! I love your quilt. The pattern you have chosen is so masculine, not something one see's very often. I love the graphic and color play on your quilt, very exciting. The swirly quilting softened it up but not too much. Definitely refreshing in a world of highly detailed quilts. And this is a project a newby quilter could tackle, I think. This one will go on my list of designs to try. 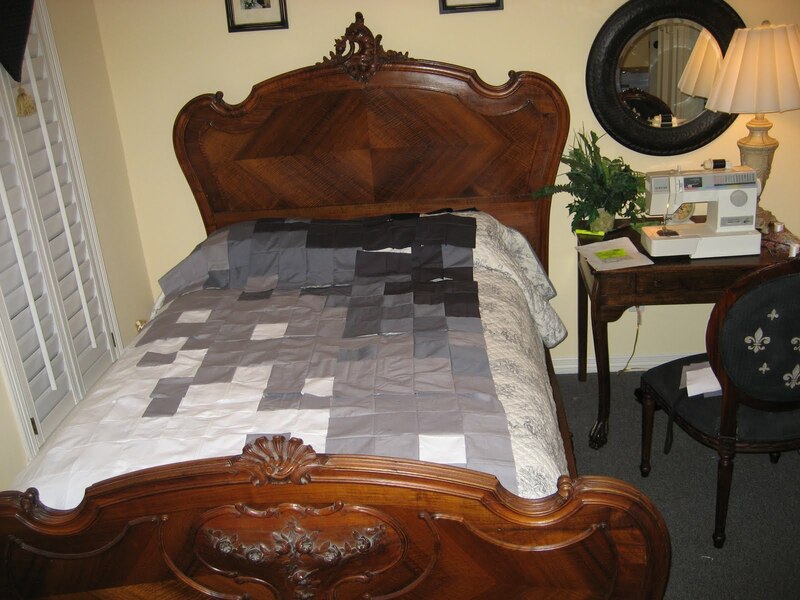 This quilt is simply awesome – great job! Fantastic. I like the modern look of it. The quilt looks great! Found your link from Life in the Pitts link up party! I host a Friday link up party I would love you to come join! Looks great – it's always hard to come up with a design for a guy, I think. This looks so professional! The quilting really made it! Great update on a classic; terrific work! You know, I've never made a quilt before. But this one looks like a lot of fun! I might have to give it a try. Wow, I totally love this quilt, I've been all over the world on this little trip, and I really think I love this one the best! I'm a black and grey kinda person 🙂 Thanks for the inspiration! What an inspiration of how to make a design and follow through. Your quilting of it is wonderful! Beautiful quilt and very manly!! Very unique and fun! Thanks for sharing with Sweet charli! I love the quilt. Perfect for a guy and that special embroidery really finishes it off. Nice! Very striking. Pleasing to the eye. That neutral quilt is a wonderful present for your boyfriend. I liked the way you wrote up your post to double as a tutorial. How very pretty! I love your quilt! Love the quilt.Great job on the personalization too. What a great design! Very inspiring! what a graphic quilt-great job. Oh my goodness…so easy I could even do it with two small kids and a full time job. Thanks for your simple ingenuity! Very creative and cute! I'm sure your boyfriend treasures this awesome quilt! Thanks for linking up to It's Party Time Thursday #8 @PonyTails&FishScales;!